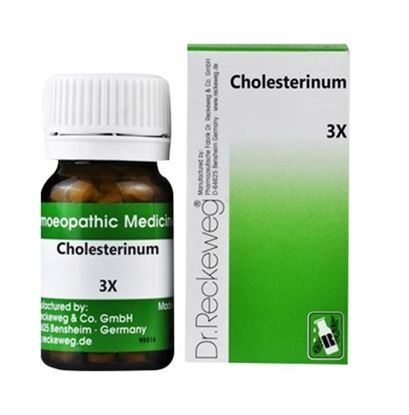 Information about Dr. Reckeweg Cholesterinum Trituration Tablet 3X CHOLESTERINUM TRITURATION TABLET This homeopathic remedy is prepared from cholesterine found in egg yolk, blood, brain, bile, seeds and buds of plant. 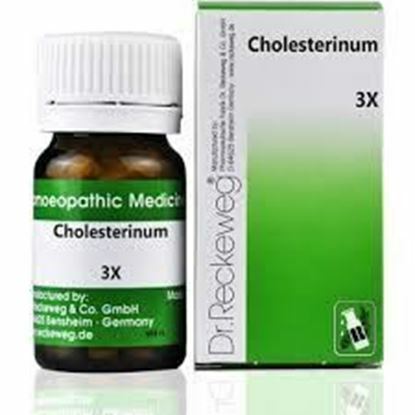 It is indicated for the following condition- Abdomen Liver cancer and liver enlargement. Burning pain so much so that he needs to hold on to the side of abdomen while walking. Jaundice Excellent remedy for colicky pain in abdomen due to Gall stone. Pain cannot touch the abdomen and is more on lying on sides. Eye Liquid in the inside of the eye becomes opaque, leading to loss of vision Dose- 4 tablets of Cholesterinum twice a day each day for 3 months unless otherwise prescribed by physicians. Can be taken along with allopathic medicines. Precautions Maintain half an hour gap between food/drink/any other medicines and homeopathic medicine. Avoid any strong smell in the mouth while taking medicine e.g. camphor, garlic, onion, coffee, hing.